Book of Ra slot machine is based on Novomatic’s game of the same name. This is 5-reel slot machine with 9 lines and free spins. It is free-spins that contain the flavor of this slot machine, because there you can win significant prizes of hundreds and thousands of initial bets per line. Free Spins are the spins for which you do not have to pay credits. It is a kind of a reward for long game. Free spins appear randomly, as well as the other combinations that bring wins. To begin the next 10 free spins, three or more Book of Ra symbols appear on the screen (on any of the fifteen visible symbols of all 5 reels). If in the case win combinations appeared on playing lines, they are paid before free spins. This win is added to total win in free spins. The bets and the number of playing lines for free spins are the same as in the last played spin in the main game. All payouts for winning combinations per lines are summarized per 10 spins. In addition, before starting 10 free spins, a “lucky” symbol is specially assigned to the player of the symbols on the reels. "Lucky symbol" brings additional wins, as it expands to all visible reel fields vertically. In calculating winning lines formed by "Lucky symbol" the number of symbols on playing lines is taken into account regardless on their position. Free spins are played on the reels of the same layout as in the main game, so there is the probability of additional 10 free spins, which will begin immediately after the current free spins end. When launching the slot machine, the player can not choose the cost of one credit. One credit may be equal to 0.01 xBTC or 0.1 xBTC. Before a new spin, you can select the number of playing lines by pressing LINE 1 ... LINE 9. Bet per playing line is cyclically changed from 1 to 25 credits by pressing BET. You can spin the reels by pressing SPIN. If any line where you have a bet, has two (for some symbols), three or more same symbols standing side by side starting from the left reel, you win according to payout table available when pressing HELP in the game window or in the end of this page. When playing slot machine for cash, autoplay function becomes available that is activated by an additional AUTO button (over SPIN button). In this mode, the reels make next spin automatically, while maintaining the same bets and number of lines. In addition, "lucky symbol" is automatically selected for free spins. 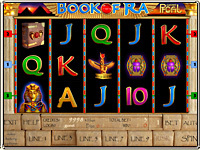 1) When Book of Ra symbol appears in three or more places on the screen, a player wins 10 free spins. 2) Book of Ra symbol is a wild symbol, and may substitute any of the symbols to make a winning combination. 3) Also, the book symbol is a scatter symbol. This means that win is paid for its appearance even if Book of Ra symbols stopped randomly on the screen, and do not make a line. When calculating win for the appearance of this symbol, the coefficient shown in payout table is multiplied by Total bet. If you wish, after payment in the main game, you can try to double your win. To do this, press RISK. Two closed sarcophagi will be shown to the player. The player shall open the sarcophagus with golden mummy of Pharaoh. By using LINE 3 and LINE 7 buttons or clicking on one or another sarcophagus, the player shall move the top plate of one of the sarcophagi. If the player finds a mummy on the first try, the win will double and the player will be offered the same level of gambling game. When the player opens an empty sarcophagus he loses his current win. To abandon gambling game and return to the main game press SPIN. At all levels of gambling game, a chance to double is 50%. The number of levels is 9. Maximum amount to double is 5000 credits. After free spins the player may also start gambling game, according to the rules described above. The interface of the new Book of Ra slot machine has some changes. For example, play buttons are changed, gambling game became clearer and more interesting. Despite these changes, the slot machine has not lost its dynamics, as symbols on the reels have retained their values, and the amounts of payments for combinations of per lines do not differ from the original ones. Payout table for the combinations is shown at the bottom of the page. A significant feature of the new slot machine is that it, as all the games we offer, has built-in fair play control system, which will help the player to make sure that reel stop positions are random. Full layout of the reels with the number and order of all 43 characters is given at the bottom right. Fair play control system of the slot machine applies to the game per lines, gambling and of course free spins. In addition to the option to control random stop of the reels, the player himself, before 10 free spins participates in selection a "lucky symbol", which brings win to him. Fair play control system is designed so that the player can not literally select one or another symbol, but making a choice on a certain number from 1 to 9, he directly influences on selection of a "lucky symbol". Ways of reel stopping and gambling game of BOOK OF RA slot machine are the same as the mechanisms previously detailed in Slot Machine Fair Play Control on the example of Crazy Monkey slot. Regardless of the player’s decision to participate in gambling game or not, line of the outcome for each new spin of the reels contains data on the presence or absence of the mummy of Pharaoh in some tomb for each of possible 9 levels of gambling game (separated by a colon ":"). Part of the line Double=0,1:1,0:1,0:1,0:0,1:0,1:0,1:0,1:1,0means that on the first level, pharaoh mummy is in the right sarcophagus (0,1), on the second level, the mummy is in the left one (1,0), on the third – in the left one (1,0) (1,0), etc. If the player decides to play gambling game after free spins, gambling game will be played according to the data contained in line of the game outcome generated in the main game for a spin, after which free spins began. Each five numbers specify the positions of reel stopping for 10 free spins. Before the start of free spins, using "+" and "–" buttons, the player can set the offset for the reel stopping. The numbers set by the player will apply to all 10 free spins. In addition, the game outcome line contains data on "lucky symbols" in the Book of Ra: FreeSymbols=1-F,2-Q,3-R,4-10,5-K,6-J,7-A,8-S,9-I, specifying the number with a certain "lucky symbol". For example, the number 1 corresponds to F symbol (Pharaoh), the number 2 corresponds to Q (Queen), etc. The correspondence of the values to the reel symbols is given in the table.